As Ancient Theodosiopolis in Armenia (or "in Cappadocia"), the former bishopric remains a Latin Catholic titular see. The city uses the double-headed Anatolian Seljuk Eagle as its coat-of-arms, a motif that was a common symbol throughout Anatolia and the Balkans in the medieval period. During Roman times, Erzurum was named Theodosiopolis (Latin: Theodosiopolis, Greek: Θεοδοσιούπολις), or – in Armenia or – in Cappadocia to distinguish is from several namesakes. It got its present name after its conquest by the Seljuks following the Battle of Manzikert in 1071. A neighboring commercial city named Artze (Arcn, Arzan; Armenian: Արծն) was heavily sacked by the Seljuk Turks in 1048–49. Its Armenian, Syrian, and other Christian inhabitants moved to Theodosiopolis, which they began calling "Artsn Rum" (meaning Artze of the Rûm, i.e., Romans) to distinguish it from their former residence. After the Arab conquest of Armenia, the city was known to the Arabs as Kālīkalā (which was adopted from the original Armenian name Karno K'aghak' (Armenian: Կարնո քաղաք), meaning "Karin City", to distinguish it from the district of Karin (Կարին). Some older sources derive the name Erzurum from the Arabic Arḍ ar-Rūm (Arabic: ارض الروم‎) 'land of the Rûm'. In fact, the powerful noble family of the Kamsarakan in Armenia traced their genealogy to the Iranian Kārin Pahlav family of the Arsacid period, and specifically to one Pērōzmat (only attested by Movsēs Xorenacʿi, p. 219). The Armenian Kārins, the Kamsarakan, remained a powerful dynastic family in the region, directly involved in the history of the Byzantines and the Sasanians, and in Armenian political sphere up to the 14th century, carrying the surname of Pahlavuni, in commemoration of their origins. They lent their name to important localities, so that ancient Theodosiopolis was named Kārin, before the name was changed to Erzurum in later centuries. In 1821, during the last major Ottoman-Persian War, the Ottomans were crushingly defeated at Erzurum despite a numerical superiority by the Iranian Qajars at the Battle of Erzurum (1821). In 1829 the city was captured by the Russian Empire, but was returned to the Ottoman Empire under the Treaty of Adrianople (Edirne), in September of the same year. During the Crimean war Russian forces approached Erzurum, but did not attack it because of insufficient forces and the continuing Russian siege of Kars. The city was unsuccessfully attacked (Battle of Erzurum (1877)) by a Russian army in the Russo-Turkish War of 1877–78. However, in February 1878, the Russians took Erzurum without resistance, but it was again returned to the Ottoman Empire, this time under the Treaty of San Stefano. There were massacres of the city's Armenian citizens during the Hamidian massacres (1894–1896). The city was the location of one of the key battles in the Caucasus Campaign of World War I between the armies of the Ottoman and Russian Empires. This resulted in the capture of Erzurum by Russian forces under the command of Grand Duke Nicholas and Nikolai Nikolaevich Yudenich on February 16, 1916. Erzurum reverted to Ottoman control after the signing of the Treaty of Brest-Litovsk in March 1918. In 1919, Mustafa Kemal Atatürk, one of the key founders of the modern Turkish Republic, resigned from the Ottoman Army in Erzurum and was declared an "Honorary Native" and freeman of the city, which issued him his first citizenship registration and certificate (Nüfus Cuzdanı) of the new Turkish Republic. The Erzurum Congress of 1919 was one of the starting points of the Turkish War of Independence. Erzurum, known as "The Rock" in NATO code, served as NATO's southeastern-most air force post during the Cold War. After the long Byzantine-Sasanian War of 572-591, Byzantine rule was extended to all western parts of Armenia, and emperor Maurice (582-602) decided to strengthen political control over the region by supporting pro-Chalcedonian fraction of the Armenian Church. In 593, regional council of western Armenian bishops met in Theodosiopolis, proclaimed allegiance to the Chalcedonian Definition and elected John (Yovhannes, or Hovhannes) of Bagaran as new Catholicos of Chalcedonian Armenians. Palandöken in August 2009, as seen from downtown Erzurum. Nine kilometres to the west of Erzurum, in the village of Gezköy, stands the ruined Monastery of Saint Minas of Kes. 2011 Winter Universiade opening in Kazım Karabekir Stadium. The K-95 /left) and K-125 (right) ski jumping towers at Kiremitliktepe. The Statue of Nene Hatun, (1857 – 22 May 1955) was a Turkish folk heroine, who at her age of twenty showed bravery during the recapture of Fort Aziziye in Erzurum from Russian forces at the start of the Russo-Turkish War of 1877–1878. ^ a b c d e f Inalcik, Halil (1965). "Erzurum". In Lewis, B.; Pellat, Ch. ; Schacht, J. (eds.). The Encyclopaedia of Islam, New Edition, Volume II: C–G. Leiden: E. J. Brill. p. 712. ^ Garsoïan, Nina G. "Theodosioupolis". Oxford Dictionary of Byzantium. Oxford: Oxford University Press, 1991, vol. 3, p. 2054. ^ a b See Joseph Laurent's extensive note in his (in French) L’Arménie entre Byzance et l’Islam depuis la conquête arabe jusqu’en 886, 1919, new edition revised and updated by Marius Canard, Lisbon: Librairie Bertrand, 1980, pp. 87–88, note 83. ^ (in German) Markwart, Joseph. Südarmenien und die Tigrisquellen nach griechischen und arabischen Geographen. Vienna: Mechitharisten-Buchdruckerei, 1930, pp. 41, 334, 339. ^ Hewsen. "Summit of the Earth", pp 42–44. ^ (in Armenian) Darbinyan, M. «Էրզրում» [Erzurum] Armenian Soviet Encyclopedia. Yerevan: Armenian Academy of Sciences, 1978, vol. 4, p. 93. ^ Kemalettin Köroğlu: The Northern Border of the Urartian Kingdom. In: Altan Çilingiroğlu/G. Darbyshire (Hrsg. ): Anatolian Iron Ages 5, Proceedings of the 5th Anatolian Iron Ages Colloquium Van. 6.–10. August 2001. British Institute of Archaeology at Ankara Monograph 3 (Ankara 2005) 101. ^ Hewsen, Robert H. Armenia: a Historical Atlas. Chicago: University of Chicago Press, 2001, p. 103. ^ Garsoïan, Nina G. "The Foundation of Theodosiopolis-Karin" in Armenian Karin/Erzerum. UCLA Armenian History and Culture Series: Historic Armenian Cities and Provinces, 4, ed. Richard G. Hovannisian. Costa Mesa, CA: Mazda Publishers, 2003, pp. 63–72. ^ (in Armenian) Arakelyan, Babken N. "Հայաստանի Խոշոր Քաղաքները" ("The Great Cities of Armenia") in Հայ Ժողովրդի Պատմություն [History of the Armenian People]. Yerevan: Armenian Academy of Sciences, 1976, vol. iii, p. 232. ^ Whittow, Mark. The Making of Byzantium, 600–1025. Berkeley: University of California Press, 1996, pp. 310, 320. ^ Whittow. The Making of Byzantium, p. 322. ^ Arakelyan. "The Great Cities of Armenia", pp. 232–233. ^ A Global Chronology of Conflict: From the Ancient World to the Modern Middle, Vol.III, ed. Spencer C. Tucker, 1140. ^ Dadrian, Vahakn N. Warrant for Genocide: Key Elements of Turko-Armenian Conflict. New Brunswick, N.J.: Transaction Publishers, 1999, p. 141. ^ Balakian, Peter. The Burning Tigris: The Armenian Genocide and America's Response. New York: HarperCollins. pp. 59, 127–129. ISBN 0-06-055870-9. ^ See Richard G. Hovannisian, "The Competition for Erzerum, 1914–1921" in Armenian Karin/Erzerum, pp. 378ff. ^ Meyendorff 1989, p. 108-109, 284, 343. ^ "Europe gas pipeline deal agreed". BBC News. 2009-07-13. Retrieved 2009-07-13. ^ "Turkey, EU countries sign gas pipeline deal". Today's Zaman. 2009-07-13. Archived from the original on 2009-07-18. Retrieved 2009-07-13. ^ "Nabucco Summits Begins". Turkish Press. 2009-07-13. Retrieved 2009-07-13. ^ Ian Kelly (2009-07-13). "Signing Ceremony for the Intergovernmental Agreement on the Nabucco Pipeline" (Press release). United States Department of State. Retrieved 2009-07-13. ^ "A lens on Lenz on the South Side". ^ "Climatebase.ru – Erzurum, Turkey". ^ "Urmia, Erzurum sign sisterhood agreement". 7 April 2015. Robert Curzon (1854). Armenia: A Year at Erzeroom and on the frontiers of Russia, Turkey, and Persia. London: John Murray. (in Armenian) Ter-Ghevondyan, Aram N. "Կարին-Թեոդուպոլիսը ավանդության և պատմության մեջ" [Karin-Theodosiopolis in Tradition and History]. Lraber Hasarakakan Gitutyunneri 3 (1971). Hovannisian, Richard G. (ed.) Armenian Karin/Erzerum. UCLA Armenian History and Culture Series: Historic Armenian Cities and Provinces, 4. Costa Mesa, CA: Mazda Publishers, 2003. "Erzurum". Grove Encyclopedia of Islamic Art & Architecture. Oxford University Press. 2009. Wikivoyage has a travel guide for Erzurum. Wikimedia Commons has media related to Erzurum. Pourshariati, Parvaneh (2017). "KĀRIN". Encyclopaedia Iranica. ArchNet.org. "Erzurum". Cambridge, Massachusetts, USA: MIT School of Architecture and Planning. Archived from the original on 2012-10-23. 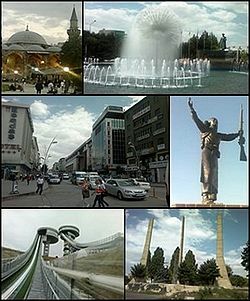 Erzurum Province is a province of Turkey in the Eastern Anatolia Region of the country. It is bordered by the provinces of Kars and Ağrı to the east, Muş and Bingöl to the south, Erzincan and Bayburt to the west, Rize and Artvin to the north and Ardahan to the northeast. Kahramanmaraş is a city in the Mediterranean Region of Turkey and the administrative center of Kahramanmaraş Province. Before 1973, Kahramanmaraş was named Maraş. The city lies on a plain at the foot of the Ahir Dağı and has a population of 1,112,634 as of 2017. The region is best known for its distinctive ice cream, and its production of salep, a powder made from dried orchid tubers. It is connected by air to İstanbul and Ankara. Turkish Airlines has daily direct flights from İstanbul and also AnadoluJet operates direct flights from Ankara. Bayburt is a city in northeast Turkey lying on the Çoruh River and is the provincial capital of Bayburt Province. Şebinkarahisar is a town in and the administrative seat for Şebinkarahisar District, Giresun Province in the Black Sea region of northeastern Turkey. Malazgirt is a town in Muş Province in eastern Turkey, with a population of 23,697. Şebinkarahisar District is a district of Giresun Province in northeastern Turkey. It is inland from the Black Sea in the Giresun Mountains. The administrative seat is the town of Şebinkarahisar. Its area is 1,318 square kilometres (509 sq mi). The Karin dialect is a Western Armenian dialect originally spoken in and around the city of Erzurum, now located in eastern Turkey. Phasiane, is a historical region now part of the Eastern Anatolia region of Turkey. Speri, also known as Sper, is a historical region now part of the Eastern Anatolia region of Turkey. It was centered in the upper reaches of the valley of the Çoruh River, its probable capital was the town of İspir, or Syspiritus as indicated on the map next to the Byzantine-Sassanid border, and it originally extended as far west as the town of Bayburt and the Bayburt plains.